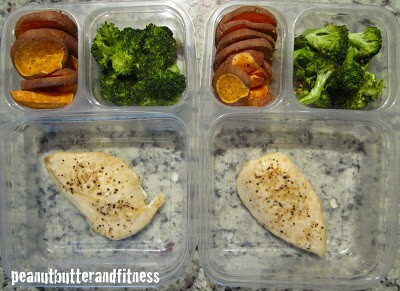 Here’s my easy bake oven version of meal prep…super duper easy and takes less than 30 minutes total. 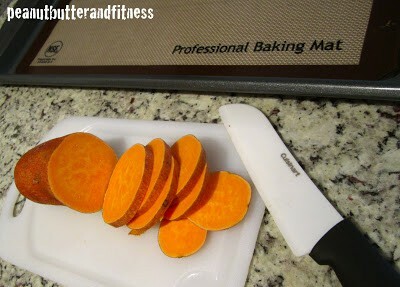 All you have to do is toss some protein and veggies on a cookie sheet and stick it in the oven for a little bit. 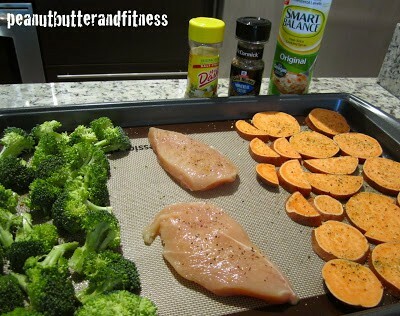 I’ve been digging broccoli lately, so that plus some chicken and sliced sweet potatoes made my meal here. I only made two days worth, but it’s pretty easy to double or triple that. I love when I hear people at work tell me that they don’t have time to eat healthy. That’s when I say “oh really, this only took me about 30 minutes, cooking included. Plus it’s way cheaper and healthier than that Jimmy John’s sandwich you’re eating.” No offense to Jimmy John’s, I’m told it’s delicious. And fast like lightning. Anyways, to cook, I just cut everything up, put it on my non-stick baking mat (or you could use some non-stick spray), then sprayed a little Smart Balance cooking spray on top of the veggies. I seasoned the chicken with Montreal Steak Seasoning – very yummy but you have to be careful how much you put on, it’s got a lot of salt in it. Then I seasoned the veggies with some Mrs. Dash original salt-free. Pop in the oven at 400 degrees for 18-20 minutes.